The Many Uses of this Moto-Tool. 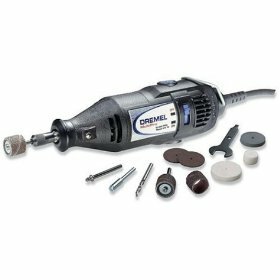 The Dremel Tool or Moto-tool can be used for a variety of different jobs. Although you might think of it only as a drill, it can be used for grinding, sharpening and cutting, cleaning, polishing, sanding, routing, carving and engraving. In woodworking, it is useful for drilling holes, sanding work pieces, cutting and carving designs into the wood. In finish carpentry, it is useful for practically all jobs, including coping by using a drum sander attachment. Coping can be challenging for do-it-yourself homeowners. In case you are unfamiliar with the term, it has to do with shaping the end of one molding, such as a baseboard, to fit the contours of an adjoining molding. This becomes even more challenging when the molding being used is decorative. An example is decorative crown molding, which sometimes has many twists and curves. In order to have perfectly matched inside corners, you start by running the first piece directly into the corner and attaching it as you normally would. To cut the second piece you will need a hand saw and a miter box or a specialized saw, referred to as a miter or coping saw. The miter saw is used to make the first 45 degree cut. This Moto-tool can be used for a variety of different jobs. Although you might think of it only as a drill, it can be used for grinding, sharpening and cutting, cleaning, polishing, sanding, routing, carving and engraving. is used to cut down the natural line of the wood until you reach the curve that is present on most styles of baseboard. With practice and the complete set of attachments, you can use the Moto-tool for all kinds of fine finish work. Although we often think of woodworking when we think of the Moto-tool, there are other uses which mayinclude an assortment of cordless models designed for unique purposes. For pumpkin carving, pet nail grooming, golf club cleaning and a variety of other purposes. The rotary tools make use of high speed rather than torque to get the job done. It was so unique at the time of its introduction that similar tools are often referred to as Dremels even though they are made by different companies. Since 1993, the company has been a division of the Robert Bosch Tool Corporation. Originally established by Albert J. Dremel in 1932, the company was independently owned and operated for over 60 years. To stay in business that long, you have to make something good. You have to be better than the competition. I think most woodworkers would agree that the The Dremel Tool or Moto-tool can be used for a variety of different jobs. Although you might think of it only as a drill, it can be used for grinding, sharpening and cutting, cleaning, polishing, sanding, routing, carving and engraving. Return From The Dremel Page to Home - Finishcarpentryhelp.com.